Starting off the series with positive energy. After months of preparation, I'm finally starting a series for my blog aptly named: A Nail Date with Kim Cao. This series incorporates unique creatives that I've hand-picked, and I will be asking each person a set of random questions to get to know him or her better. My first appointment was with our dearest family friend, Thrice Groove. The one and only Thrice Groove is one of Atlanta's top DJ's and has held his weight throughout the years. If you find your waistline moving, that's how you know Thrice is spinning. Mr. Groove is a jack of all trades, but also a master of all, since he has shown strong interest in other creative outlets such as fashion and modeling and has since started to release his own original body of work. In 2018, Thrice Groove released his first album titled Nu Season, available on all music platforms. The title was purely coincidental to the naming of our daughter , thus resulting in the super cool, very appropriate shoutout in the song "How You Fit In". He has also released the EP: Groove Theory, a sampling of his ability to amalgamate any set of songs to create an entirely new sound. This was Thrice's first manicure. If you could be any cartoon character, who would it be and why? The early Spongebob Squarepants, he's classic. What is the worst dish you've ever made in the kitchen? Wait, before I ask that, do you even cook? Haha I actually do try to cook quite often. I wouldn't say it was an actual mistake, but it definitely happened after the cooking was done. I think I was making curry chicken and when I went to taste it, there was a strong taste of dish soap. What is your most memorable DJing experience? I have two. My first was AFROPUNK 2016. That was actually the first one Atlanta hosted. My set was right in between ABRA and Tyler, the Creator. The energy was wild. I performed in front of about 8,000 people so that just really put things into perspective as to what I can do. 8,000? That's crazy. Do you ever get stage fright? Even when I perform at the weekly spots, I get nervous, but that was definitely an experience to remember. The second [memorable experience] was last year at Terminal West, you guys were there for the Soulection Radio Tour by Joe Kay. The energy in there was just so organic. It was one for the books. I really appreciate my relationship with Joe as far as the connections I've made through him and overall as a friend. Rashgmaal and I attended the Soulection Thrice Groove performed in, and we left feeling buzzed off of all the positive energy emitting from everyone there. If you were stuck on a desert island, what five albums would you need to survive? ***We had to revisit this question several times. I don't know if I'll be able to name five off rip, but for sure would HAVE to have A Tribe Called Quest. I listen to them everyday, no matter my mood. Music for sure, and I do a little writing. Like journaling? Do you have a preference of pen or stationary? Not for a pen per se, but a good Moleskine will do the trick for me. I do a little journaling, not only with my lyrics, but just any thoughts I have, even if its just a sentence. It's cool to go back and revisit my thought process from the past just to see the progression. Thrice Groove usually DJ's in trainers because he's looking to be "comfortable and fly", but anyone that knows Mr. Groove knows his collection of sneakers is extensive to say the least. It seems that for EVERY new release, Thrice gets his hands on them. It's safe to say: we all need Thrice's sneaker plug. How many pairs of sneakers do you have in your closet? I've done some slimming down, but right now I have about 120. I've been trying to focus on quality over quantity. What is your favorite sneaker? Whew, this is a tough one. I have a couple honorable mentions, but Jordan 1's for sure, any of the black toe's. Favorite color way: Bred. What is your honorable mention? One of Mr. Groove's most popular songs is "Quiet as Kept". 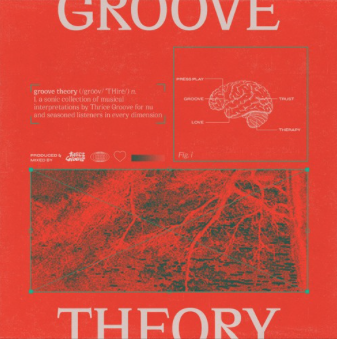 Although we have known each other for quite some time, I find myself always learning something new about Thrice Groove every time we meet, truly embodying the phrase. My motivation is that we have the ability to continue to write our narrative. The book is never closed. Things that inspire me are nature, thoughtful conversation, music (!) and the energy of those close to me. If you don't already follow Thrice on instagram, @thricegroove, I STRONGLY encourage you to for the sheer fact that he posts an affirmation almost daily. When I brought it up, he spoke about how he bases what he posts off of the energy of the day and how he is always surprised when someone reaches out in response to his affirmations saying how it's applicable to the situation he or she is experiencing. I can attest to this because I, myself, have found myself openly receiving the words he eloquently states. Throughout the conversation, Thrice Groove referenced his songs in normal conversation, in fact if you aren't familiar with his music, you wouldn't have caught it. Performing behind the DJ Booth may be his occupation of passion, but I wouldn't limit his abilities to just that. Expect big things from Mr. Groove. If you could recommend anyone to participate in A Nail Date with Kim Cao, who would it be?